As we celebrate the 12th World Autism Awareness Day, we are reminded that autistic individuals now find themselves less marginalized despite their different ways of communicating and different perceptions of the world. Beijing's Yanqing district releases its new branding and mascot on March 29, ahead of the Beijing Expo 2019. 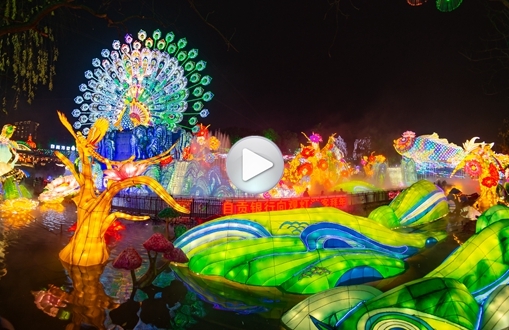 If you've seen a Chinese lantern before, it was probably made in Zigong, Sichuan province. However, the best place to see them is at the city's lantern show. The three bridges standing over the Yi'ong Tsangpo River in Tibet are an example of the development and improvement of the region's transport networks. Xu Jiayin, Chairman of the Evergrande Group, topped the list of top 10 global real estate tycoons in 2019. For thousands of years, the communication between China and India has given birth to great ideas, religious thoughts, and philosophies. Nevertheless, Daya Thussu, a visiting scholar at Tsinghua University said, the two countries still have great potential for social advancement in the digital era. Qamdo Experimental Primary School, the first modern school in Tibet, has significantly changed over the past decades, epitomizing education development in the region. Portuguese soccer player Cristiano Ronaldo retained the crown of World Fame 100 this year. The rapid urbanization of China's rural areas is creating a growing lobby for traditional village protection and revitalization involving scholars, local government officials and villagers. China will work to keep its skies blue, its water clean, and its land pollution free. Take a look at how this will be achieved in 2019. Here are eight major topics from China's 2019 two sessions, with comments from Chinese officials and China watchers around the world.